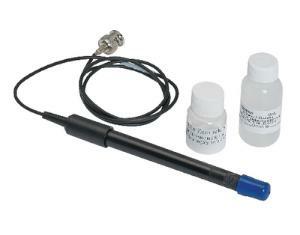 This electrode is compatible with Ward's DataHub units. It extends the versatility of your Ward's DataHub unit. Plug it into the input already located on the DataHub unit to instantly measure the concentration of dissolved oxygen in water. The maximum sample rate is 10/s, and the range is 0-14 mg/L. Ordering information: This sensor includes five replacement membranes, a dissolved-oxygen filling solution, and sodium sulfite calibration standard (2.0 m Na2SO3).